What makes a Tour de France? Is it the winner? The crowned champion who triumphs over all others? Is it the podium, which, by definition, speaks something of the hardest battles that the champion has had to win.? From a distance, the record book is often all we have but we all know that even this most final of interpretations can be re-written, crossed out or marked with the heavy significance of a simple ‘*’. Is it the geography? The spectacle of human pitted against Nature. Even when the champion elect has shed the pretenders to his throne he must still battle the terrain and the elements. The fight is never over: the strongest must conquer Nature once, dispatch their opponents next and then, only then, defeat Nature again to become a true champion. For many, the Tour is The Road – the eternal past of the story, upon which fleeting mortals come, conquer and disappear again. The Road goes on, awaiting the next players. Or is it the disaster and scandal? The word “Festina” for example, is a loaded shorthand in cycling, not only for the 1998 doping scandal to which it specifically relates but to multiple Tours and races around that watershed. It has become shorthand for a generation of doped riders, a decade of tainted memories. Is this what makes a Tour? Our desire to reduce complex narrative to a singular moment, place or phrase is as old as complex narrative itself. Richard III? “A horse, a horse, my Kingdom for a horse..” And it’s no different for the Tour, itself a uniquely complex sporting narrative. The 1910 Tour is often reduced to Lapize’s vicious words, spat at the Tour organisers who introduced the high mountains to the already punishing early editions, “Vous êtes Assassins. Oui, des assassins!“. The 2001 Tour is usually presented as no more than ‘The Look’ Armstrong gave to Ullrich on the lower slopes of Alpe d’Huez before accelerating alway to yet more yellow-clad glory. The Inner Ring’s often excellent, precise précis of more recent races, “The Moment The Race was Won” is this same desire writ large. We love complexity in our sport but we love it even more when we can distill that complexity back into something simple again. 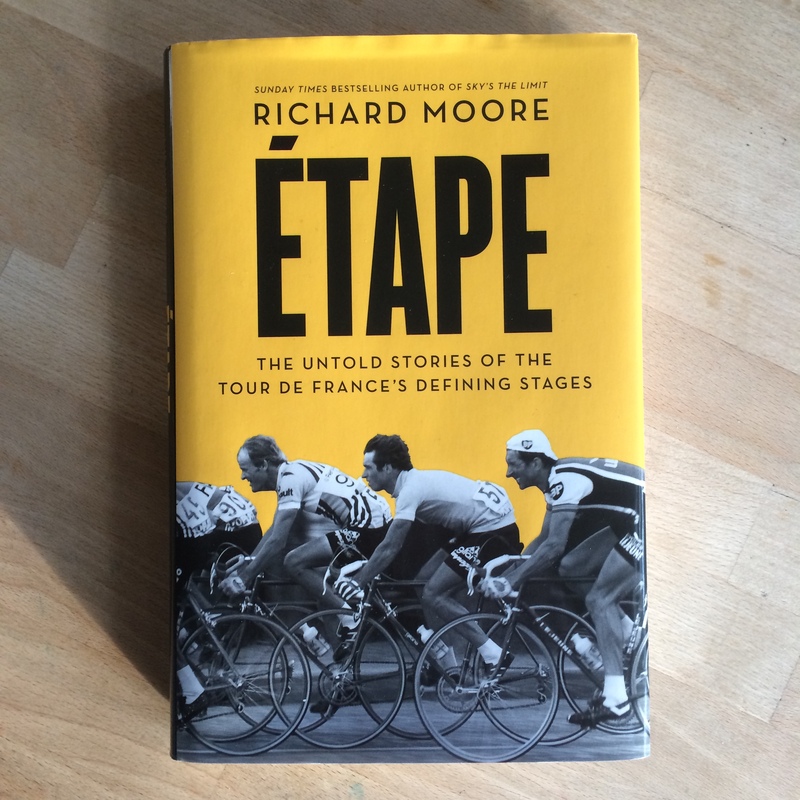 On the face of it, Richard Moore’s ‘Étape’ (Harper Sport, RRP £20) seeks to achieve that self-same distillation. At a recent event where he spoke about the book, he said that his aim was, “To tell the story of the Tour de France through a few of it’s finest stages”. An exercise in reductivism if there ever was one. But the opposite is also true. By focussing in on a single stage from a particular Tour he can, to a certain extent, ignore the narrative of the Tour itself and tell a story that is perhaps more of a wider truth. In some of the chapters in the book he is even able to ignore the result of the actual stage itself – for the truth that he is relating, be it one of suffering, or camaraderie, or hope, or despair (or even all four) is a more universal one. Instead of reducing the wider narrative down to that of a single moment, he seeks to use those microscopic moments to throw open the narrative as wide as possible, and encourage parallels, not only with those who have gone before, but of those who will come later. Contrary to all the surface evidence, this is not just a book of potted cycling histories. It’s also a guidebook charting the highs and lows of the endeavour required to try, fail, succeed or survive any trial of physical or psychological challenge. One of the obvious places to look for ‘other stories’ is at the ‘other end’ of the peloton.. Whilst the action rages at the front for honours and glory, there are equally gruelling battles being fought at the back. For team mates, for pride, for survival. Moore’s decision to ask Mark Cavendish about his hardest day on the Tour, inevitably one of the high mountain days, is a window into a world that we rarely see. And is all the better for it. His duet of pain with his mountain minder Bernhard Eisel is a touching picture of friends suffering together, falling out together, making up together. Elsewhere we find that the untold stories are, in fact, at the very front of the peloton. The story of the second biggest winning margin on a single stage – told in apparent fullness by the press in print at the time – turns out to be quite different from the recorded facts. An overly long lunch stop by the press corps in 1976 meant that the details of the stage win by little known Spanish rider José Luis Viejo was, in many respects, fabricated by the journalists when they realised that they had missed the action. So even when there is a story out there, we find there is sometimes another version of it. Of course the more well known Giants of the Road are represented as well. Bernard Hinault acts as a recurring touchpoint throughout the book, which goes back as far as Merckx, but Lemond, Ocaña and, potentially controversially, Lance Armstong also figure along with Fignon, Roche, Maertens, Chiappucci, Pantani, Schleck, Herrera and Boardman. The inclusion of Armstrong makes more sense in this book than it would in an equally celebratory volume with a different set-up. In his interview with Armstrong, poignantly held on the golf course, the banned Texan makes a fair point, “Those Tours happened.” Although the results have since been deleted (much to Armstrong’s ongoing chagrin) the story of the actual stage remains as relevant and fascinating as it was the day we first watched it. Armstrong is a central pillar in the book. Just like the other five-time winners covered – Merckx, Hinault and Indurain – his dominance at the time cannot be ignored. But here, as with real life of late, he doesn’t get the last word. Moore gives that to Greg Lemond, the boy who came back from the dead to conquer the Tour twice more. Along with the opening chapter on Chris Boardman’s exploits in the Prologue Time Trials of the Indurain era, these sweet-tasting book-ends do much the counter some of the sourness that needs to be covered elsewhere. In other chapters it is the fruits of Moore’s new interviews that add the flavour – as well as a feel good punchline to Bobby Julich’s story about his tussle with Pantani and Ullrich in 1998, there’s a peek inside the diabolically soft-furnished world of Chiappucci’s Italian apartment and an uncomfortable revelation by Freddy Maertens about the true location of Pollentier’s infamous bulb of unadulterated urine..
Étape is an unusual (but excellent) book. I had thought I would be able to pick it up and put it down at will, reading a chapter here, a chapter there, in splendid isolation from the others. But that proved difficult. There is a structure that binds the stories together, a hidden narrative that swells as the pages turn. But each chapter also has to forge a new beginning, introduce new characters and goals, reveal new alliances and enmities. It’s like the sea coming in, wave after wave hitting the shore. We can choose to see it as a number of waves or more simply as one turn of the tide.. But it’s also more complex than either alone. Each tide has its waves and each wave has its own stories; different and unique from the last, the next, or another. And if you just catch a few waves, as Moore has brilliantly done in this latest offering, you’ll know that there are millions more stories out there waiting to be found. This entry was posted in Le Tour de France, Pro cycling, Product Reviews and tagged alpe d'huez, armstrong, bernard hinault, boardman, cavendish, eisel, etape, fignon, lapize, lemond, maertens, millar, pantani, schleck, Tour de France, viejo. Bookmark the permalink.